These events really bring out the creativity in your group as teams work together to develop a strategy, theme, or new invention. 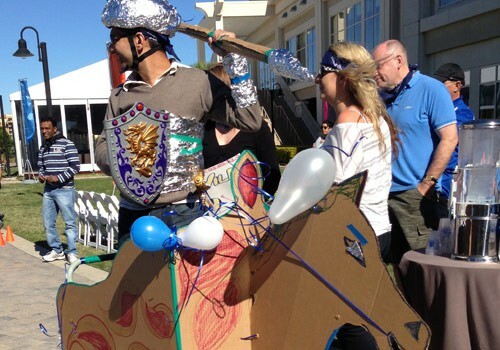 Be prepared to be impressed with the ingenuity and creative talents of your group! Teams may think this event is a piece of cake, but there’s a lot to do if they want to top all other teams! 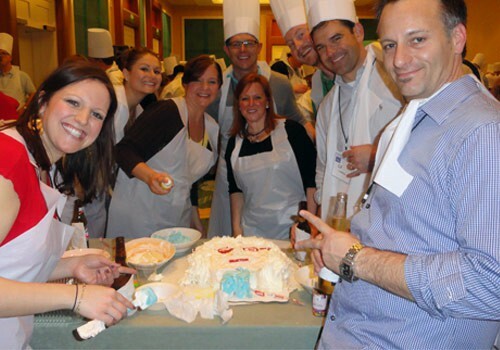 Teams must decorate a cake, chef’s hats and aprons and whip up a presentation that’s better than all others, or they’ll get creamed! It is usually considered impolite to make a scene. But, during this team building activity, it’s actually encouraged as teams use a custom app on an iPad to create their own must-see commercial or film for their company. The activity ends with a video viewing and awards for the clips the audience enjoyed the most. During this event, teams turn one of their members into a superhero. Then, using a special app on an iPad, they record a video highlighting the hero’s superpowers and how they will use them to save the day and overcome some of the challenges facing their company. Spirits soar as high as a superhero during the viewing of the movies at the end of the activity. With regards to team building, it’s time to raise the bar – a tiki bar, that is! 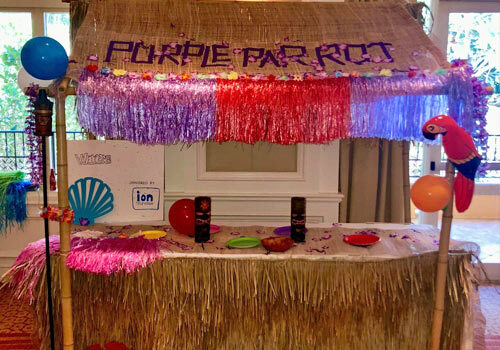 Everyone is sure to hold a torch for this event, which finds them transforming an ordinary classroom table into a tiki bar! Choose to pair this with a tropical drink-making challenge to give this event more punch! The perfect event if you want everyone working together on separate teams to come together as one at the end of the event. Teams compete in different physical, mental and creative challenges to collect art squares. The more squares they collect, the better their score, but all are decorated and pieced together on a giant mural at the end of the event, resulting in a big reveal of a logo or secret message! This event, which builds on the popularity of Escape rooms, finds teams racing to be the first to unlock a chest on the main stage as a countdown clock counts down. What the chest contains is a mystery that your group must reveal! Who will be the one that’s smart enough to solve the clues that allow them to unlock the chest? Only time will tell and that is limited… But, the first to do so will be richly rewarded! Get Your Team’s Creative Juices Flowing! Icing on the Cake – I can’t express the appreciation I have for dealing with a company that sees a project through from A to Z. Made my job so much easier not having to deal with following up on the details. Wildly Different made it easy for me to focus on other things, they took care of their part. Thanks it was FUN! 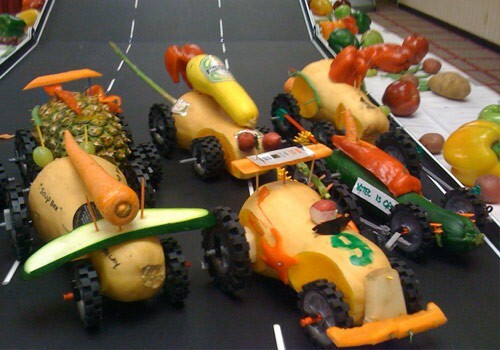 Spud Racer – What a great event! We had six hundred sales people who over the course of an hour and a half had a blast! 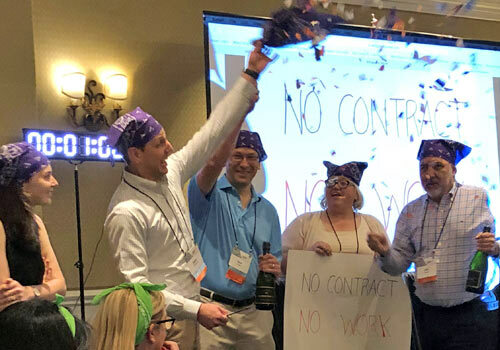 Not only did they get to demonstrate their competitive side, but the creativity and marketing skills employed were exactly what the management team was looking for in an event to help them blow off a little steam. Everyone had a great time at the event. The MC’s and staff made this event a memorable one and one that may become an annual competition! Thanks Wildly Different, you once again exceeded expectations!!! Our client wanted a meaningful activity for 576 people that had to be done 70 people at a time in in 20 minute sessions…with only 10 minutes to reset the room between each of the 8 rotations. Many ideas were “canned” before we landed on having teams recreate sculptures of iconic locations on the Las Vegas strip using packaged food items that would be donated after the event! Guests were assigned a specific structure to recreate, so the Las Vegas strip would slowly be formed as the day went on. At the end of the event, 56 teams had built everything from Mandalay Bay down to Freemont Street. Everyone dreams of hitting it lucky in Las Vegas and on this date, one charity did! All of the canned food items were used to restock the shelves of a local food bank, making everyone involved in the event feel like a winner! Ready to Plan Your Creative Team Event? Contact Us Today.